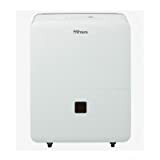 Danby - DDR60A3GP : Dehumidifier Review • The Air Geeks, reviews of air conditioners, dehumidifiers and air purifiers. Have you been having a problem with excess moisture and you are looking for a strong dehumidifier? If your answer is yes, then you should consider the DDR60A3GP. This humidity control system offers many exciting features and pulls a lot of moisture from the air in a day. Yes, at the Air Geeks, we loved it. Considering that you could be planning to purchase this unit for your dehumidification needs, we have gathered all the information that you need to have to make a wise decision. The description below explores its features, performance, and even weaknesses. By the time you are through, you will be able to decide whether this is the best solution for your dehumidification needs or not. Let the tests begin! To start with, the DDR60A3GP is suitable system for medium and relatively large rooms. Although this unit is recommended for a 1,000 sq. ft space, it can be used in rooms that are as big as 3,600 sq. ft. In addition, this dehumidifier is capable of pulling up to 60 pints of moisture from the air in 24 hours. At this rate, it ensures that the relative humidity of your room is maintained within the set level. The DDR60A3GP features a built-in pump that enables it to pump the condensate to a sink that is at a higher level. When the unit is in this mode, it can run continuously without requiring the attention of the user. This option is suitable when the dehumidifier cannot drain the captured water under gravity. In case you don’t want to pump the condensate (we don’t really love this, either…), you can set the unit to collect the captured water in a bucket. Alternatively, you can drain the captured condensate to an external sink under gravity by ensuring that the unit is at a higher level than the sink. The intuitive user interface of the DDR60A3GP allows users to adjust the relative humidity with ease. In addition, the unit features a remote control and a 2 speed fan. It also allows you to program the humidity settings depending on your preferences. Does the DDR60A3GP consume excess power? Well, even though it’s true that most high capacity dehumidifiers tend to consume a lot of power, we have observed that this unit has higher power needs and can make your overall electricity consumption to rise. The impact can be bigger if the unit is run continuously without breaks. But remember (as this is important to understand lifetime cost) : compared to some units of slightly higher capacity, this dehumidifier consumes more power. Most dehumidifiers produce sound but the levels vary from one model to another. From our research, we have noted that this unit is noisier than some dehumidifiers of slightly higher capacity. As such, the DDR60A3GP may not be a suitable option for use in bedrooms and other quiet places. The remote control. This unit comes with a remote control that enables the user to adjust settings without the need to walk to where the unit is positioned. Built-in pump enables the unit to pump the condensate to a sink. Sometimes the captured water cannot be channeled to a drain by relying on gravity. In such cases, this built-in pump comes in handy. Comes with two drain tubes. 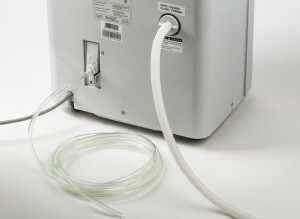 The unit comes with two hoses and the user therefore does not need to buy them separately. Consumes a lot of power. When running continuously, this 590W dehumidifier can have a significant impact on your electricity bill. Noisy fan. 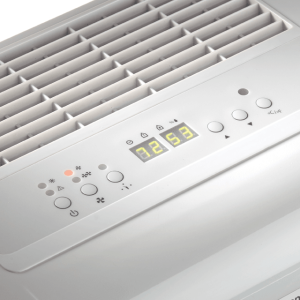 Although most dehumidifier produce sound, we have observed that this unit has a noisier fan that can be a source of distraction especially if it is positioned in the living room or bedroom. After extensive online review, I bought this Danby model to replace a recalled Kenmore dehumidifier that I'd been using in my basement since June. My main considerations: ability to work in temps down to 41 degrees, quietness, good quality and reliability. I ordered it on Oct 7 and it actually arrived on Oct 9 -- super fast service from Sylvane. It was very well packaged and the setup instructions were easy to follow. This model is categorized as a "large" dehumidifier (60 pints), but the cabinet is actually the same size as the replaced "medium" 50 pint Kenmore and is quieter (probably still too noisy if you want it upstairs in a living room, etc). Overall, it seems to be well built; no rattles or poor finish. The control panel (on top) indicates exact %, e.g. 47% and the current room temp. This continuous fan will stay on unless the machine is actually turned off. I attached a garden hose so it will drain into my floor drain (it comes with a 6.5 ft drain hose, which wasn't long enough for me; if you use the pump, it includes a pump hose that is 16.4 ft). As you are looking at the back of the unit, the hose attachment is on the back to the right; the electric cord (6 ft) is out the back on the left bottom. I found this arrangement more convenient than the Kenmore's hose attachment on the side. The dry air is expelled from the top of the unit; the intake air comes in from the front. There is a remote control and they included 2 AAA batteries for it. It has memory, so will default to the last setting when power is interrupted and a light to indicate when it's defrosting. I had to search out was whether this model was Energy Star rated -- and yes, it is, just in case your state has energy rebates. I have high hopes that it will last and be efficient-- my basement stays damp all year long and it will be run 24/7, so we'll see." very well-built and powerful unit. i'm using it in a 1400sf open plan finished basement, where humidity has been quite constant between 66-70% for 5 weeks since i moved in. set up the unit 11pm last night, by this morning at 9:45 the humidity was down to the 45% i'd set the control to, very impressive. minutes later, the bucket was full and i emptied it. the good news is that it has a large 60 pint bucket; the bad news is that getting that bucket out of there when completely full is very difficult, and it's impossible not to spill water while doing so, and the bucket empties clumsily. the further good news, though, is that 2 different continuous drain systems (gravity and pumped) are available. i set up the continuous drain one right away, and it's working great. the pumped one has a 16' hose and claims to be able to pump the water 16' vertically; i haven't tested that. the fan on it is surprisingly powerful, but as a result surprisingly noisy. it is not defective; it's just moving a Lot of air, even in the Low setting. the compressor is virtually silent, to my surprise, and the unit has no rattles or other noises; good build quality. people complaining about heat don't understand how dehumidifiers work, apparently: you're essentially running an air conditioner inside your house, of Course it produces heat, duh. people saying it doesn't turn off either have a defective unit or they are setting the target humidity too low so it is never reached; my unit turns off when it reaches the target humidity, but if i set it unrealistically low, of course it doesn't turn off. i bought this unit after checking reviews here while standing in Costco, because i'd never heard of Danby; figure the least i can do is provide a review." If you are looking for a strong dehumidifier for your large room or basement, then the DDR60A3GP is a good option. This unit is capable of pulling up to 60 pints of moisture in a day. Unlike most dehumidifiers in the market today, this smart unit features a built-in pump and comes with a remote control. If you prefer appliances that have numerous features, then this unit is designed to meet your preferences. On the downside, we have observed that the DDR60A3GP consumes a lot of power especially when it is running all the time. If you want to save money at the expense of some efficiency, this may not be a suitable choice for you. Furthermore, we have noted that its fan produces a loud sound that can be disturbing if the unit is positioned in a quiet room. Overall, however, a very smart buy!